The project “Climate education for all” aimed to develop the study programmes and materials for education on climate change, as well as organize training for different professional audiences – local government representatives and educators. 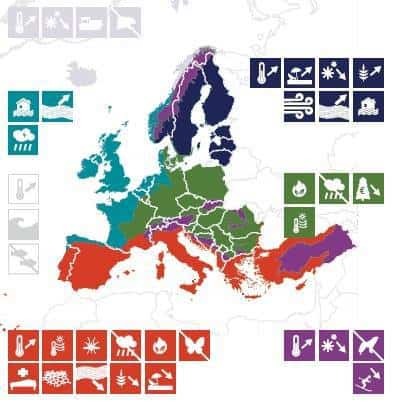 Content of programmes and training materials include information on the essence of climate change, the nature and course of the climate change in Latvia and the world, climate change projections and impacts, highlighting specific examples and links to worldwide. Among other things project describes the need to adapt to climate change (including changes in lifestyle and consumption) and adaptation solutions in Latvia and the world, as well as describe greenhouse gases emissions reduction options and the diversity of technologies and activities of implementation and climate change mitigation and adaptation according to socio-economic aspects in the Latvia. The project was targeted to the professionals – for climate change reduction responsible local government representatives and educators. The project indirectly was aimed also on the secondary and vocational education students and students of higher education institutions – to ensure the acquisition of knowledge and attitudes about climate issues, as well as advising on practical skills on a daily basis to tackle climate change. Project opening conference took place in Riga on 20.05.2015. Conference was attended by 25 people and was organized to introduce the project and to discuss the questions "How to teach?" and "What to teach? ", when talking about climate change. Here You can find the c﻿﻿﻿﻿onference materials. - "Climate Change Management" (J. Brizga). Various lecture materials about climate change and questions related to it, practical solutions for adapting to changes in Latvia and in other parts of the world, with additional emphasis on the various ways in reducing emissions. Presentations are available here. - "Climate change education and education for sustainable development of the municipalities" in Latvian (J. Zaļoksnis) - This study describes the situation of climate change and sustainable development of Latvian education and its development. - "Climate change communication possibilities in Latvian" in Latvian (M. Dragļeva) - It is important to inform and educate the public about climate change and build a more environmentally friendly attitude. However, we have to understand that people's attitudes and actions are determined by the information received. Unfortunately, for most people, global climate change is not the main priority and available sources of information is very limited. This study explains how climate change is and can be thought to the public. - "Paris Summit and decisions ﻿made" in Latvian (J. Brizga) - At the end of 2015, for two weeks Paris become a global center of the world, which gathered more than 40 thousand different climate change activists and decision makers at the UN Framework Convention on Climate change Conference (COP21). The study describes the decisions made at the Paris Summit and Latvia's and European positions at the conference, as well as the climate change situation in Latvian. 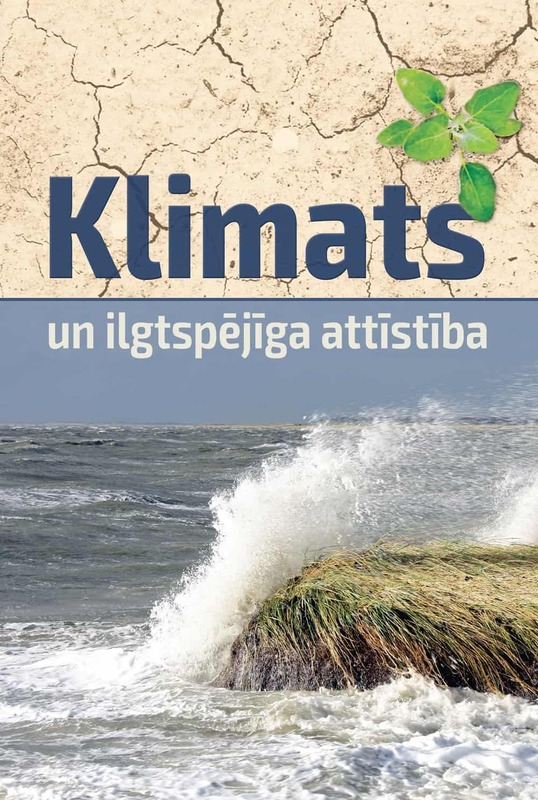 Book „Klimats un ilgtspējīga attīstība” (Climate and Sustainable Development) was printed and distributed. In this book You will read that climate change is a reality, what none of us can ignore. The climate is not only essential for daily well-being, it also directly affects industry, agriculture, power sector, tourism and other fields. - e-course "Climate Change in Latvia" (English; authors: Maris Kļaviņa Zaļoksnis Janis, Janis Brizga, Eve Ručevskis, Sven Åke Bjørke and Trista Patterson) consists of six sections: The natural greenhouse effect; The enhanced greenhouse effect; Impacts; Ecosystems; Green economy; A greener future. Each of these sections provide links to other materials and presentation materials. - e-course "Climate change and sustainable consumption" (Latvian; author: J.Brizga) deals with climate change and anthropogenic impacts to climate change and consists of five sections: Introduction; What is sustainable consumption? Climate change and carbon footprint; Sustainable Consumption Policies and Sustainable consumption policy tools. Each of these sections provide links to other materials and presentation materials. - e-course "Climate and Sustainable Development" (Latvian; authors: J.Zaļoksnis, M.Kļaviņš E. glomerular V. Melecis) - hosted by http://skolas.lu.lv/ which is designed to provide e-training materials available to actors outside the Latvian of University. To access this course you will need to register online by sending an invitation to e-studijas@lu.lv (you can also specify the number of users that are necessary). E-course content includes: 1) a set of lectures on the questions at issue; 2) lecture presentations; 3) tests for testing knowledge and skills; 4) study materials for in-depth research. 2nd. seminar was held in University of Latvia on 25.05.2016. Topics discussed in this seminar include “Education for change and transformation? Does Norway meet the challenge of education for sustainabillity and climate change?” and "The global impact of local consumption". Videos where authors of the book (Sven Ake Bjorke, Viesturs Melecis, Dagnija Blumberga, Džineta Dimante, Agrita Briede, Māris Kļaviņš, Jānis Brizga, Gunta Kalvāne, Jānis Zaļoksnis) addresses public by expleining . 4 regional publicity seminars were held in Liepāja (6.04.2016. ), Valmiera (13. 04.2016. ), Rēzekne (20.04.2016. ), and Jelgava (26.04.2016.). The goal of these seminars was to strengthen climate change discussions in the regions by involving municipalities, entrepreneurs and other interested people. 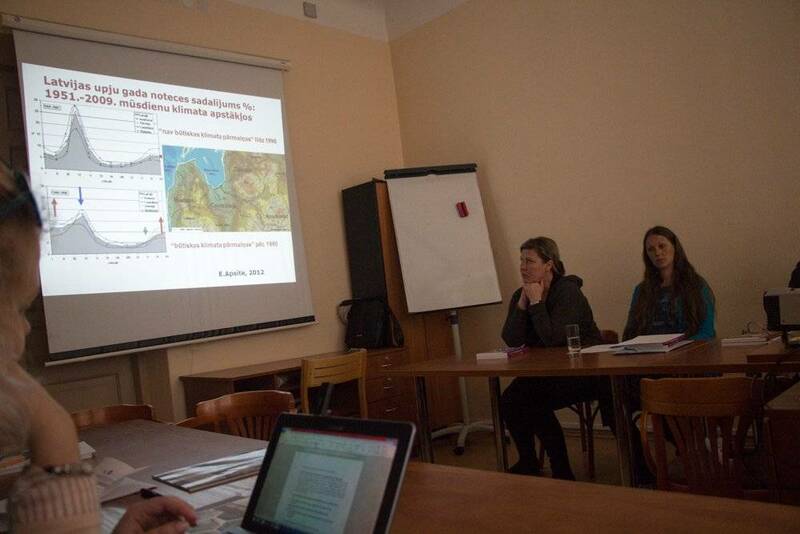 Seminar provided participants with the latest information on climate policies and analyzed climate change in Latvia. The Final conference of the project took place on May 25, 2016. More then 100 people participated to learn about the project results. The conference was opened by Tom Bricis (LTV news service journalist) "Weather forecast" and were followed by the University Rector, Professor Henry Muižnieks, Ambassador of the Kingdom of Norway Egil Hagen and the Latvian Environmental Protection and Regional Development Minister Kaspars Gerhards speeches. 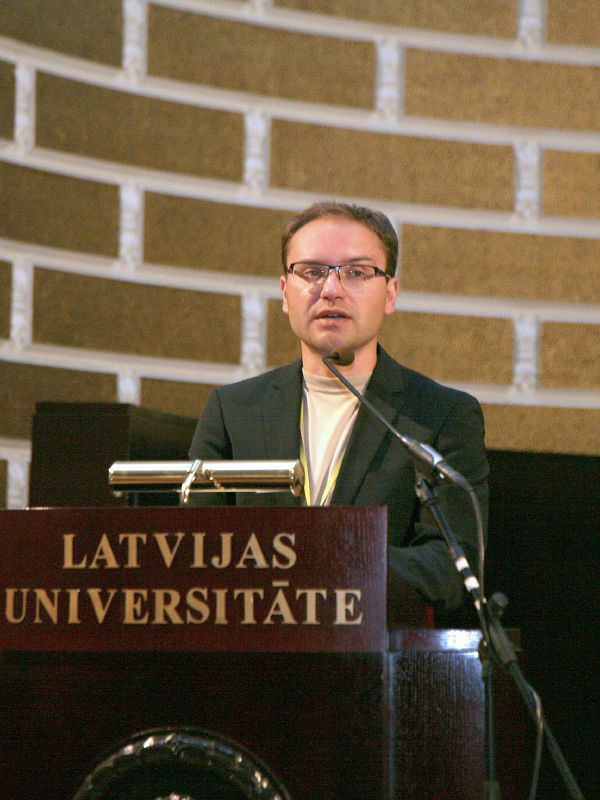 The conference discussed two main themes, which were subsequently divided into sessions: Climate change and its effects and Climate and Latvian development. Project booklet (Latvian) provides the short summary of the project results. 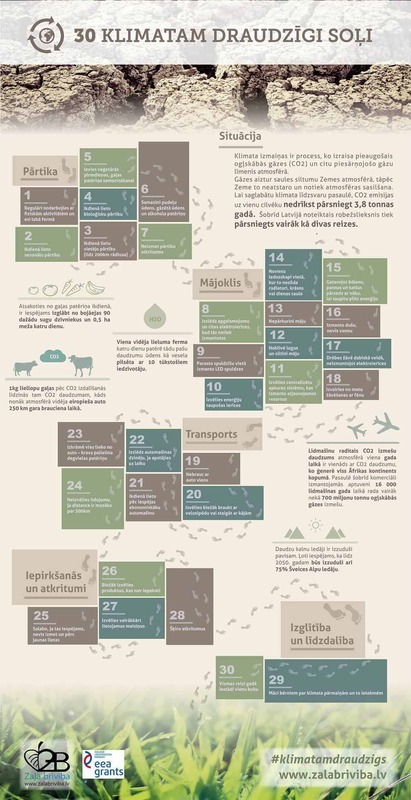 Infographic 30 klimatam draudzīgi soļi (30 climate friendly steps) - for everyone who thinks: What can I do? I can`t make an impact alone! Media coverage (in Latvian) - 18 different articles in the online and written national and regional media were published including TV and radio interviews.